Jobless claims are chopping around near levels last seen in early 2008, pointing to fewer layoffs than in the crisis years. Claims for unemployment benefits are on a roller coaster ride again, falling dramatically last week after rising sharply a week earlier. That volatility isn't unusual for March and April, when the Easter holiday and school spring breaks tend to distort the figures. About 346,000 people filed claims for their first week of jobless benefits last week, down from a revised 388,000 the week before, the Labor Department said Thursday. The figure was better than expected. 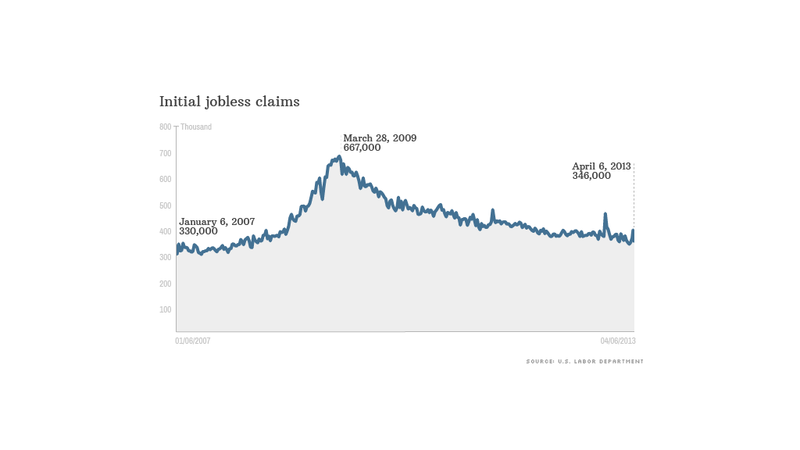 Economists surveyed by Briefing.com were expecting the report to show 365,000 people filed initial claims last week. The claims data is adjusted to account for seasonal trends, but because the Easter holiday and spring breaks can fall on different weeks every year, the numbers are often choppy in March and April. In many states, school contractors are allowed to file for unemployment benefits any time school is out of session. Some bus drivers and cafeteria workers, for example, will file for unemployment benefits during spring breaks. "The floating nature of the Easter holiday and the timing of spring breaks at schools generate difficulties in the seasonal adjustment process," said Thomas Simons, money market economist for Jefferies & Co. "It is not unusual to see increased volatility in this series at this point in the year." Smoothing out some of the choppiness shows new claims have averaged around 358,000 over the past four weeks -- a level that is consistent with weekly claims in late 2007 and early 2008, before the worst of the recession. Jobless claims are closely correlated with layoffs. The numbers indicate that firms seem to be maintaining their existing workforces. Other data from the Labor Department, released earlier this week, also back up that layoffs are back to pre-recession levels. Whether firms are accelerating new hiring though is still a big question mark. They may be firing fewer workers. But that won't be enough to bring the unemployment rate down substantially from its current level of 7.6%. The jobless claims report also showed 3.1 million people filed for their second week or more of unemployment benefits last week.